A video installation created by award-winning Dutch artists Metahaven will have its UK premiere at Brighton’s Lighthouse as part of Brighton Festival in May. 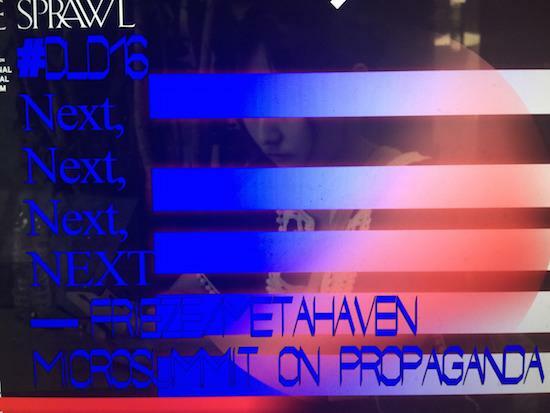 Entitled The Sprawl, the installation argues that the internet had become a geopolitical super weapon, a new and pervasive propaganda tool, and is inspired by a multitude of recent global events. It will run from Sat May 7 – Sun May 29, and is connected by two further parts: a feature-length documentary and stand-alone fragments on sprawl.space, a website to be launched later this year. For the piece, the group have worked with cinematographer Remko Schnorr and electronic musician Kuedo, whose sonic accompaniment will be played during the exhibition. We spoke to Metahaven and Kuedo about the upcoming exhibition. Metahaven, the piece has been described as a reaction to geopolitical events. Which events in particular inspired this piece, and how? What was the genesis of this piece? How did the idea come to you? MH: “In a dream.” (laughs) Definitely, we wanted to explore the affective space of psy-ops (psychological operations), the making of fantasy realities in geopolitics, and the domain where aesthetics and politics become indistinguishable and mixed-up. As the film’s subtitle “Propaganda About Propaganda” hints at, in a sense the film celebrates or propagandizes propaganda. In interviews with Benjamin H. Bratton and Maryam Monalisa Gharavi, we start to feel that the rise of propaganda under our techno-informational megastructure may be something inevitable. Also we’re into how cinematic production quality, as facilitated by cameras and software, becomes something that is evenly distributed among actors everywhere—so that everyone can now write and direct their own micro-Game of Thrones, and tropes from fantasy cinema and literature begin not to haunt the imagination but reality itself. You see that everywhere from Islamic State to Kadyrov’s Chechnya to Putin’s Night Wolves, this medieval-orthodox YouTube cyberpopulism that marries tacit network logics to ostentation and a wilful return to primeval forms of belonging. In The Sprawl this is also seen as an expansion of the interpretative space about reality as it exists in the interface, in the overlay, in augmentation. Describe your creative process with Kuedo. How much did you all collaborate, or alternatively, stick to your respective areas? MH: It was decided on that same day early on with Juha in Brighton that we would ask Jamie to write music for the film, and Juha already knew him. We were not only really into Kuedo’s music, but also into his elusively beautiful song titles, like ‘Truth Flood’, which suggest a stunning take on reality, and, more recently, an exactitude in framing intention akin to a conceptual artist. Very fortunately, Jamie said yes. At first the search was on for a kind of Eurasian pop theme, which later was slowly replaced by the more epic and monastic musical atmosphere of the final video. It is interesting to see how during editing, music begins to attach itself to particular scenes as if it was always there in the first place. During filming we always played Kuedo’s music on set, maybe so to infuse a process that later happened organically. Kuedo, how did you get involved in the piece? Jamie Teasdale (Keudo): I was aware and in huge admiration of Metahaven’s work already when they got in touch. Joe Shakespeare (co-founder of Knives) had introduced me to their print work at the bookstore where he worked, and their name had always come up in discussions about artists and designers we'd hope to collaborate with. So I was really taken aback when they messaged me on Twitter, asking whether I'd want to work with them on a project of their own. Initially the idea was to write a single theme with some variations, and create some non-musical sound design elements. It grew into something significantly less simple (laughs). But it always does. It was an honour and thrill to work with them, personally and professionally, and to work on the Sprawl project specifically. What was your approach to soundtracking the installation? JT: Well, the brief was for the project to be applied in a several forms… An episodic online documentary, a singular cinema piece, an exhibition. And they invited me to submit musical ideas very early on, pre-production, guided by early mock-up images, text snippets and Skype discussions. Initially they had a pretty specific musical aesthetic and function in mind, a kind of Eurasian pop-ist direction, and an urgent, beat driven theme to drive episodes. As the actual production came together, the feel and approach shifted to more of a feature film, and so music requirements became more atmospheric and supportive, and the musical direction took on that monastic quality. There wasn’t a visual edit to write a traditional score to, as Metahaven wanted the music to inform the edit itself, something like a music video, which is such a rare level of influence to allow to the music for such a project. So we got an idea for what kind of material would be needed, and I sent over a mix of new compositions and existing material. From there they took the mass of available music and sorted through what worked and where it worked in the edit, so they were fully the music editors in that sense. And they have such an incredible, unique feel for making aesthetic, conceptual and emotional judgments in how media & meaning interact. I got a final edit of the film just ahead of the final sound mix, which allowed just enough time to contribute some non-musical sound atmospheres and sound effect elements. Although much of the sound design for the propaganda media sequences was created by Metahaven themselves, it just worked so well. We also plan to release a soundtrack album later this year, which I expect will include some of the unused material & sketches. How is music used in the exhibition? JT: Well, Vinca and Daniel re-applied the music & sound for the film into the exhibition format. I’m looking forward to seeing how it’s used (laughs) Again I trust them completely with their decisions regarding music and sound. And likewise, Metahaven, how did you make use of Remko Schnorr’s cinematography? How much did you work with him, and direct him? MH: We approached Remko with a storyboard of photoshopped images and mock-ups that closely approached the outcomes that we wanted. And Remko did exactly that, plus more. It was amazing to be so welcomed by an experienced cinematographer, while we were very new to making films and always violating all the rules of storytelling, something other people have pointed out to us constantly, but not Remko. We were fans of Remko’s work with Sophie Fiennes, their Zizek films but also the majestic Anselm Kiefer film they did, and we felt from the first second of meeting with him that it was a natural fit. Give us some examples of what we’ll see onscreen at the installation. Will we be seeing documentary footage, viral videos and the like? Or something more abstract? MH: You’ll be seeing self-shot forests, upside down highways, people gazing at dark screens, anime prosecutors, Tolstoy citations, Ronald Reagan, CrossTalk on RT, dashcam videos, Peter Pomerantsev, Benjamin H. Bratton, Monalisa Gharavi, and much more. And what’s next for you all? Are there new projects in the pipeline? Next up for us is the online Sprawl (forthcoming at sprawl.space), a new feature film, Possessed, for which filming starts in June. A new short film for the Gwangju Biennale, following up on The Sprawl. New work with Holly Herndon and Mat Dryhurst. And much more. JT: I have some collaborations with the digital art studio Werkflow, who base their work within game engine technology, starting with some audiovisual performances at festivals this year and hopefully moving towards something release-able. There are a few games, sound design & motion projects coming up, somewhat early to describe but I’m very excited to be working other people toward their own larger projects. Label-wise there’s some exciting releases from the artists Knives and Planet Mu, J.G Biberkopf’s album will be amazing. And there’ll be a full length kuedo album this year. For more information, visit the Brighton Festival website.